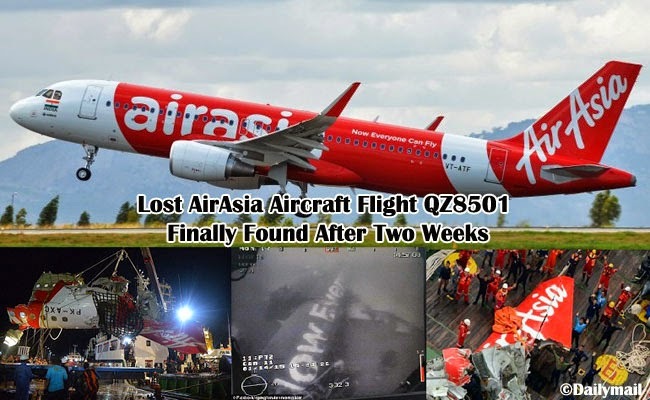 The main body of the lost AirAsia Flight QZ8501 had been finally located near the coast of Borneo after it was reported to have been missing on December 28, 2014. The aircraft was suppose to land in Singapore after a two hour flight. All 162 passengers died but only 50 bodies had been recovered. Fransiskus Bambang Soelistyo of National Search and Rescue Agency said that the divers are ready to check the discovered parts of the plane for bodies. The main focus of the team is to recover the bodies of the victims in the fuselage that had been found around 10,000 feet from where the plane’s tail had been found. It was reported that the fuselage could either be lifted in whole or in parts depending on its difficulty. Prior to the discovery of the fuselage, the black box, which is actually orange despite the name, had been found containing the necessary details to know what led to the fate of the wrecked plane. Though it will only take a couple of minutes to download the date from the black box, it will take an ample amount of time to interpret the data. Head investigator Mardjono Siswosuwarno of National Transportation Safety Committee opined that the reading of recorders found might take a week. The back box contains data such as the speed, fuel consumption, altitude, aircraft control input and air pressure changes. The investigators are expected to download the recorded conversations between the pilots and those in the air traffic controllers. It is believed that such data will help much to figure what took place before the demise of the plane. Indonesian government assured the families of the victims that the recovery of the bodies of their loved ones will still be the priority and all efforts are being done.